This drawing comes from the history entitled, Description of the City and Province of Tlaxcala, written by Diego Muñoz Camargo (ca. 1529-99), a mestizo historian from New Spain. 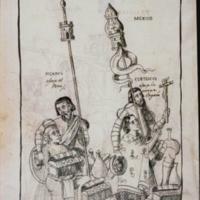 It shows an imagined scene where the Hernán Cortés, who conquered the Aztecs, and Francisco Pizarro, who fought the Inka, present their conquests, personified as a man and woman, to the Spanish kings, whose images appeared on the following pages. The Spaniards are historical individuals, but the native couple personifies the riches of the Americas, both material and spiritual: the native man presents a chest of coins, the woman prays before a crucifix. 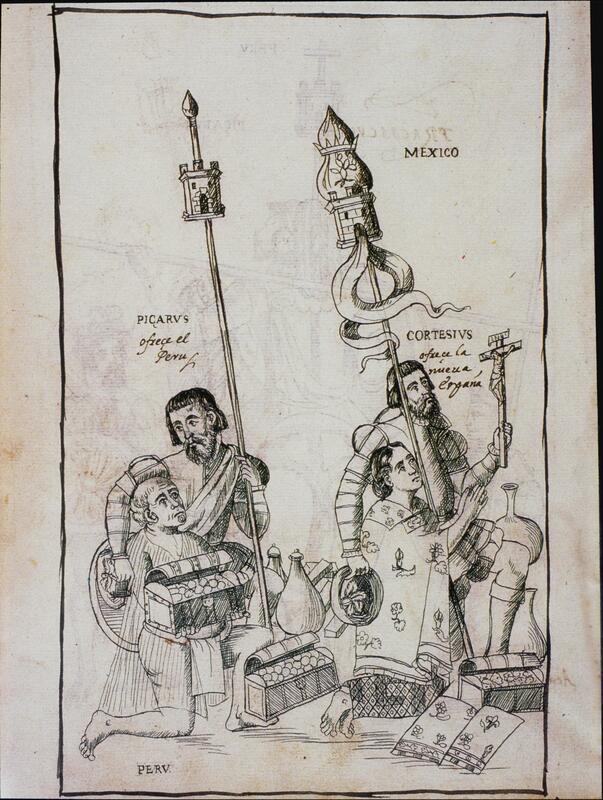 With arms wrapped around their charges, Cortés and Pizarro present this emblematic couple as their own offerings to the monarch. This text identifies Hernán Cortés in Latin as “CORTESIVS,” and Francisco Pizarro as “PICARVS.” Below the former, it reads “ofrece la nueva España,” or “he offers New Spain.” Below Pizarro, it reads “ofrece el Peru” or “he offers Peru.” Cortés led Spanish conquistadors and their indigenous Tlaxcalan allies into Tenochtitlan in 1519. Only in 1521 was he able to claim the Aztec capital for the King of Spain. Francisco Pizarro led Spanish conquistadors in the conquest of Peru, capturing the Inka capital city of Cuzco in 1533. The image casts the relationship of conqueror to conquered in terms of gender. Like a protective husband, Cortés shelters the female figure, representing New Spain, with his arm. She clasps her hands in prayer, signifying the acceptance of Christianity. The Peruvian man offers a chest of coins. Many Spaniards believed that the wealth of the mines in Mexico and the Andes was divine reward for their evangelizing efforts. Three figures look to the right, towards an image of King Charles V of Spain on horseback on the following page. It is the king who is the protagonist of the drama of conquest. Charles V is followed by a picture of Philip II, the intended recipient of Diego Muñoz Camargo’s work. Diego Muñoz Camargo was a native of Tlaxcala and member of native elit. His father was a Spanish conquistador. He wrote in Tlaxcala, an indigenous community not far from Mexico City. Tlaxcala was a long-standing enemy of the Aztec state and it allied itself with Hernán Cortés during the conquest. Thus Muñoz Camargo, as an elite resident of the city, occupied an unusual position in the early history of New Spain. The drawing is done in pen on European paper, and measures 28.5 x 19.5 cm (11 1/4 x 7 1/2 inches). The name of the artists who worked to compose the manuscript for Diego Muñoz Camargo are no longer known. Diego Muñoz Camargo wrote a reply to the royal survey, known today as the Relaciones Geográficas, as book-length manuscript, and commissioned local artists to illustrate it, likely in Tlaxcala. Muñoz Camargo took the work to Spain and it eventually passed from the collection of the Spanish monarchs to the Hunterian Museum Library at the University of Glasgow, where it is now housed. Diego Muñoz Camargo, the author of this work was a Catholic and a loyal servant of the Spanish crown; he descended on his mother's side from indigenous nobility. The illustration he included with his text is an imaginary scene that suggests that indigenous people voluntarily offered their wealth and obedience to the conquistadors and willingly accepted Christianity. For some, this may have been the case. Yet the image also “spins” history, using the image of kneeling natives protected by the conquistadors to suggest the benevolence of Spanish rule. While it is difficult to know precisely how Muñoz Camargo interpreted the conquest of the Aztecs and Inka, his imagery suggests how complex indigenous responses to the violence of conquest could be. Mignolo, Walter. 1987. “El mandato y la ofrenda: la Descripción de la ciudad y provincia de Tlaxcala de Diego Munoz Camargo, y las Relaciones de Indias.” Nueva Revista de Filologia Hispanica 35 (2): 451-84. Miller, Marilyn. 1997. “Covert Mestizaje and the strategy of ‘passing’ in Diego Muñoz Camargo’s Historia de Tlaxcala." Colonial Latin American Review 6 (June): 41-59. Muñoz Camargo, Diego. 1982-1988 [c. 1581-84]. “Descripción de la ciudad y provincia de Tlaxcala.” Relaciones geográficas del siglo XVI: Tlaxcala.